« Bounce Play or Dead Cat Bounce? 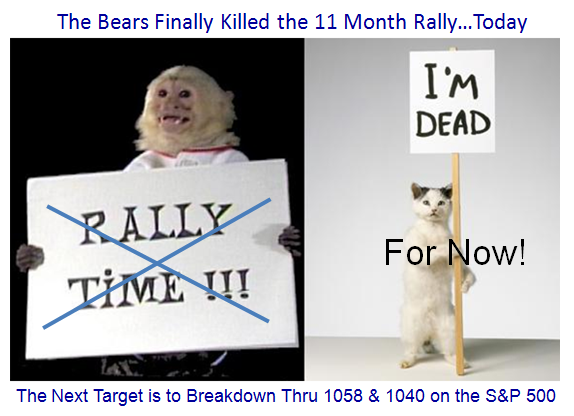 It had to happen sooner or later – the Bears had a field day today and clobbered the Market Indexes. This could well be the end of the 11 month rally, but we will have to see what tomorrow brings. The S&P 500 finished at 1063.11 and is only a meager 5 points away from an 8% Correction. Assuming we drop below that tomorrow, the next target is 10% which would take us down to 1040. 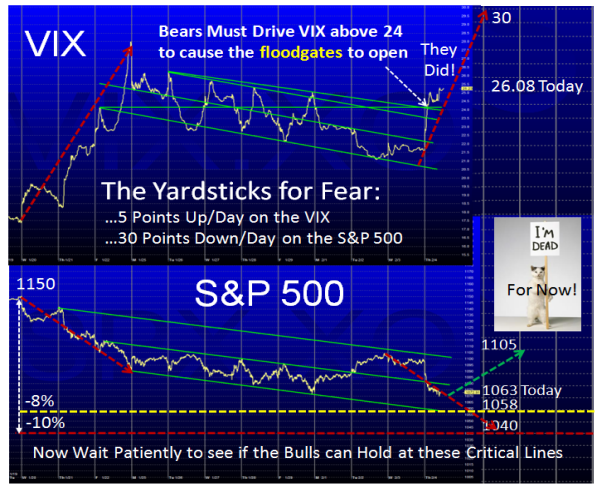 A decent clean out has been expected for months, and the Bears have waited patiently for the true signs that they have the upper hand. It goes without saying that with the expectation of a poor jobs report tomorrow that the market should drop even further, and tomorrow’s action could speak volumes of what to expect in the immediate future. In which case we can expect a further 30 point drop if these benchmarks are to confirm their value. This would imply that both lines in the sand shown above are broken for the weekend and next week’s action will prove crucial for the Stock Market. Shorts have at it with much fun, and Longs wait patiently to see how deep the carnage is or whether this was a decent clean out and a revival of the rally. All the measuring rods will be out in full force this weekend by the various gurus of Elliott Wave, Fibonacci, etc, but keep your powder dry until the dust settles. I feel sure the internals of the Market which I faithfully give you are all broken, so take your cue from that fact as there will be much repair needed after today’s numbers are digested. Just look back a few blog notes to refresh your memory, and you will see the warning signs I gave you. This entry was posted on Thursday, February 4th, 2010 at 3:40 pm	and is filed under HGS Principles, Market Analysis. You can follow any responses to this entry through the RSS 2.0 feed. Both comments and pings are currently closed.